CIRCLY is the leading pavement design software for roads and highways. CIRCLY implements a rigorous flexible mechanistic pavement design methodology that incorporates state-of-the-art pavement material properties and performance models. CIRCLY is an integral component of the Austroads Australian Pavement Design Guide. 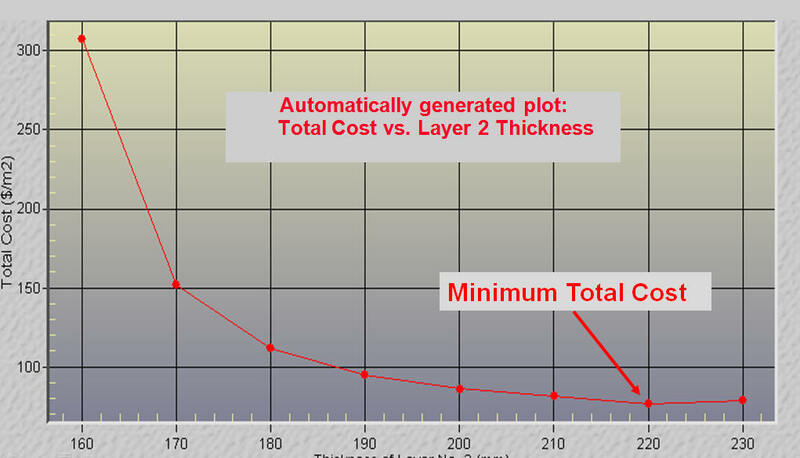 The Cost Analysis feature lets you fine tune layer thicknesses to minimize construction cost. You can specify unit costs for each material. The Parametric Analysis feature can loop through a range of thicknesses for one or two layers, while simultaneously designing the thickness of another layer. This feature will optimise up to three layers. Combining this with the Cost Analysis feature, allows for fine-tuning of layer thicknesses to minimize construction and maintenance costs. CIRCLY 7.0 accumulates the contribution from each loading in the traffic spectrum at each analysis point by using Miner’s hypothesis. the material performance properties used in the design model. This approach allows analyses to be conducted by directly using a mix of vehicle models. It is not necessary to approximate passes of different vehicles or axles to passes of an ‘equivalent’ standard load or “design vehicle”. CIRCLY 7.0 offers benefits to all parties involved in designing, constructing, owning and using pavements. Designers benefit from the inclusion of automated functions and faster analyses. Material suppliers will make significant saving because the costs and dangers of over- specification or under-specification due to inaccurate information are significantly reduced. The facility owner benefits from more efficient use of materials and will reap long term benefits. because changing traffic patterns on proposed designs can be considered and planned for.